No suitable positions? Please feel free to send a speculative application! Our goal is to provide recipients with higher-quality emails. To bring us one step closer, we introduced credit paybacks – the first company in the world to do so. When our users send exceptional email campaigns, we reward them with email credits. What innovative ideas do you have? We’re a team. We are open and honest with each other, and mutual trust and dependability are of utmost importance. Our customers are always the focal point. We are open to suggestions for improvement and always strive to provide high-quality solutions to every problem. We’re not just efficient – above all, we’re effective. We want to be better than the rest, so we work as effectively as possible from day to day. We are a young team with flat hierarchies. You can bring your own ideas to the table and take on your own projects. We are looking to the future: Newsletter2Go should continue to grow and develop. You’re not just another cog in the wheel: with us, you can truly make your mark and contribute to the success of the company. We need your knowledge, skills and enthusiasm! Are you looking for tasks that challenge and inspire you? With us, you won’t just be passing the time – you’ll have plenty of opportunities to grow and develop. Program innovative new features for our software, come up with creative marketing strategies or find solutions to our customers’ problems – boredom is not an option! 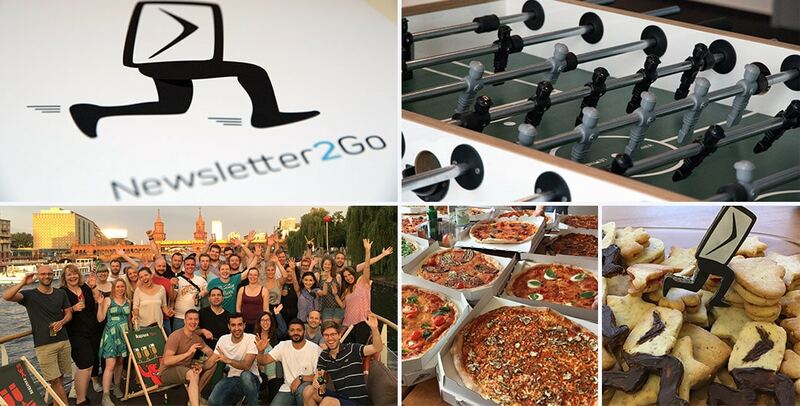 At Newsletter2Go, you’re not just an employee – you’re part of the team. Open communication and team spirit make for a great working atmosphere, and regular team events ensure plenty of fun and variety. In the meantime, join your colleagues at the kicker table. Our office is based near Wittenbergplatz, right in the heart of West Berlin and practically opposite the world-famous KaDeWe. You can easily reach the office by public transport (U1, U2, U3, U9, S5, S7, S75 as well as several buses). Countless restaurants and cafes are just a stone’s throw away, and the kitchen is always well-stocked with tea, coffee, water and Club-Mate.